Justice Roars: Will Judge Raymond Bigelow Face Investigation? The US Department of Justice has shown a real determination to challenge New Orleans police violence and corruption. Their report on the NOPD, released in March, confirmed what community members had been saying about the department for decades. In addition, their investigations led to convictions of officers involved in the murders of Henry Glover and Raymond Robair. This month, thanks to federal investigators and the tireless efforts of organizers and family members of the victims of police violence, the officers involved in the shootings and cover-up on Danziger Bridge are expected to finally face trial. Now that more than a dozen NOPD officers have been charged in the killings in the aftermath of Katrina, and the U.S. Department of Justice is investigating other incidents - including the shooting death of Adolph Grimes III on January 1, 2009 - observers wonder how far federal investigators are willing to go. The DOJ has looked into charges against Orleans Parish Prison – will they look at other actors in this systemic problem? One person involved in Danziger so far has remained above the law, but this is an opportunity to change that. Will Judge Raymond Bigelow finally face investigations over his actions and blatant conflict of interest? A little background: Bigelow began his career as a prosecutor in 1983 under DA Harry Connick and eventually became his first assistant. Bigelow campaigned for a judgeship as an advocate for “victim’s rights,” and once elected, in 1993, he earned a reputation as a judge who always sided with the police. But it was during the Danziger Bridge case, when Bigelow refused to recuse himself despite numerous blatant conflicts of interest, that the judge may have finally overreached, and shown himself to be definitively unreliable as a neutral mediator. Bigelow subsequently used a technicality to dismiss the state charges against the Danziger cops, who now face federal charges. 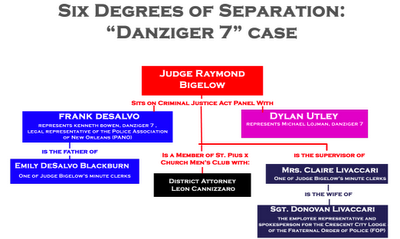 To many observers, it seemed from the beginning that the fix was in on the Danziger case. "I didn't expect (Bigelow) to give a fair ruling today," Dr. Rommell Madison said at the time of Bigelow’s ruling. Dr. Madison is brother of Ronald Madison, one of those who was gunned down on Danziger Bridge by NOPD officers as he was trying to flee the floodwaters of Katrina on September 4, 2005. "I didn't expect him to have any forethought to say 'this is why, this is what's happening.' It was already predecided,” added Dr. Madison. Among the questionable connections noted at the time of the Danziger trial: Police Association of New Orleans legal representative Frank Desalvo, who also represents Danziger defendant Kenneth Bowen, is the father of one of Judge Raymond Bigelow’s minute clerks. Another of Bigelow’s clerks is Claire Livaccari, the wife of Sgt. Donovan Livaccari, employee rep resentative and spokesperson for the Crescent City Lodge of the Fraternal Order of Police. Bigelow also sat on a criminal justice act panel with Dylan Utley, lawyer for Danziger defendant Michael Lohman, as well as Desalvo. Finally, among the Judge’s other compromised affiliations is the fact that he is a member of the St Pius X Church men’s club with DA Leon Cannizzaro. The city’s Metropolitan Crime Commission (MCC) praised Bigelow for moving his docket quickly. MCC president Rafael Goyeneche said at the time of his retirement that Bigelow was one of the most effective jurists on the court. However, they didn’t seem to be interested in the substance of his judgments, and the clear bias he showed. Pam Metzger, associate professor of law at Tulane University Law School, has noted, "The US Constitution says process matters more than speed, so I think it would be a very serious error in a state that has so many wrongful convictions for us to simply evaluate these judges based on their case processing speed." Metzger added that we should evaluate judges “based on their compassion, legal insight and reputation for fairness, honor and integrity." Cruz also notes that her former organization, Safe Streets Strong Communities, sued to get access to Bigelow’s records on how he used his judicial expense fund. Judges have wide discretion on how they spend from the fund, which comes from fines and fees paid by defendants. Safe Streets won in court, but Bigelow never released the records, despite a court order. “I think that he's just a textbook example of the kind of behind-the-scenes public corruption that people aren't willing to put a spotlight on,” says Cruz. Safe Streets also was the organization that led the fight to reform the city’s notoriously corrupt and ineffective pre-Katrina public defender system. The leadership of the former indigent-defense board were close associates of Bigelow. After fifteen years as a judge, Bigelow quietly retired at the end of 2008 – not long after he dismissed the charges against the cops involved in the Danziger Bridge incident. Although his career as a judge has ended, the aftermath of his biased work as a judge continues to affect the lives of those he may have unfairly sent to prison, as well as the police he protected. no matter what officials are replaced, the people who replace them will become just as corrupted and abusive. Power corrupts, and absolute power corrupts absolutely. It's as true for the most committed anti-authoritarian as it is for the fascist. Anyone who gets into power becomes corrupted. But it is good to know the details of the ways people become abusive and corrupted, so thanks for writing this!